As soon as we got the drive we flashed in the latest version of the microprogram - 1.0c. 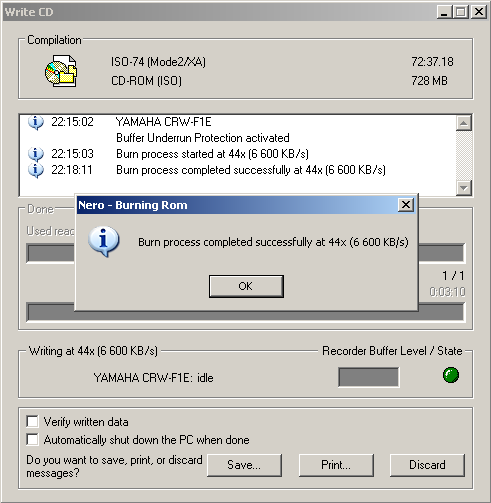 The most interesting feature of the Yamaha's recorder is burning of text and graphics information on unused CD-R area. A graphics image can be scaled; up to 128 gray gradations are supported. 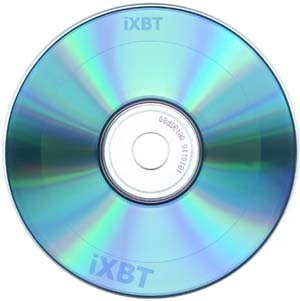 This technology is called Disc T@2. 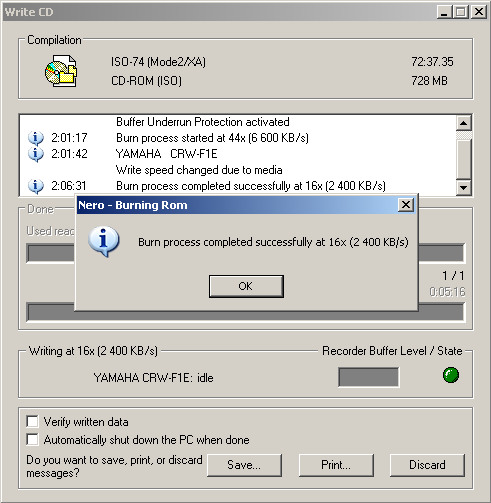 At present only the Ahead's program Nero Burning ROM can create Disc T@2 identical to creation of CD covers. Enable the "Burn Disc T@2" and you will get a window where you can edit an image or text to cover a CD with. With more time and richer imagination you can create real masterpieces with the Disc T@2. 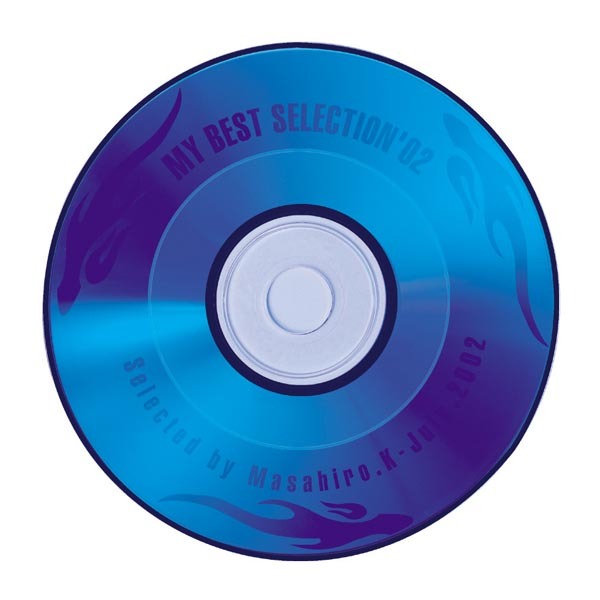 You don't need special discs for this operation. 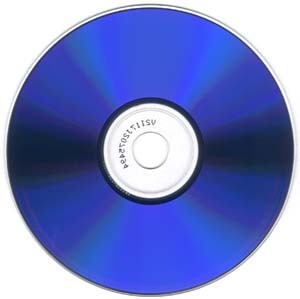 But images look better on darker discs with a cyanine active layer. A phthalocyanine disc can be used as well, but pictures will hardly be discernible. 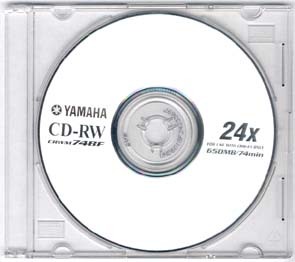 CD-RW are not supported. One of the best solutions is Verbatim DataLife Plus. 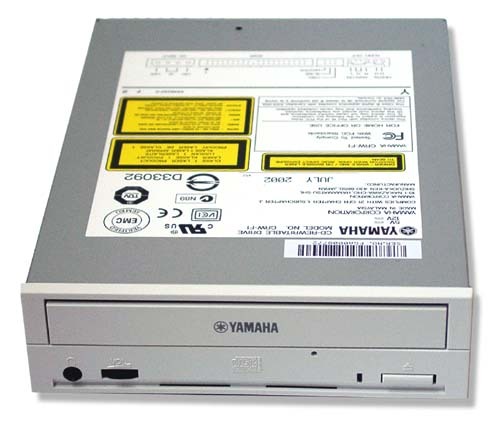 A Yamaha's disc is the one. The Yamaha CRW-F1 also supports the Mount Rainier. This format is adopted and supported by most leading drive makers. 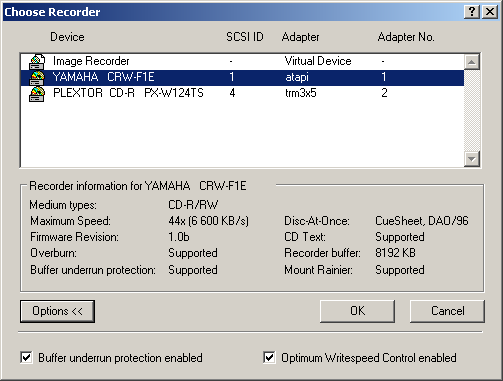 In less than 3 minutes spent for formatting a standard CD-RW you can start using it for writing/rewriting. 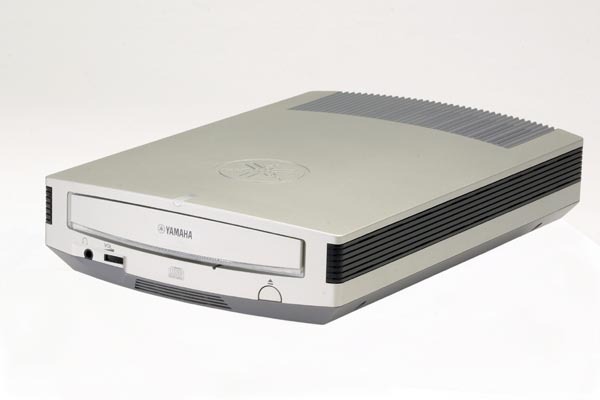 The Mount Rainier is actually an improved technology of background formatting offered by HP, which makes possible to use a CD-RW disc as a standard floppy disc. 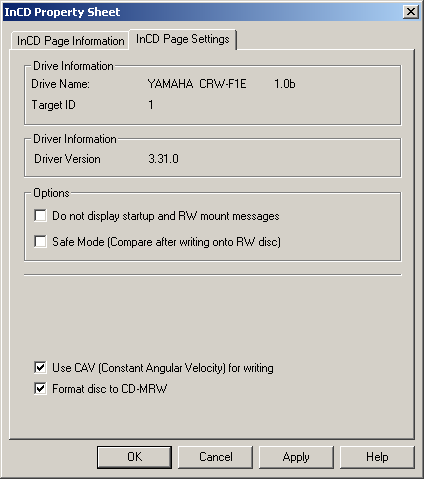 The CRW-F1 can work in the Full-CAV mode when writing CD-RW media. It provides a small speed gain as compared with the standard P-CAV. The SafeBurn technology is one of the most perfect ones. 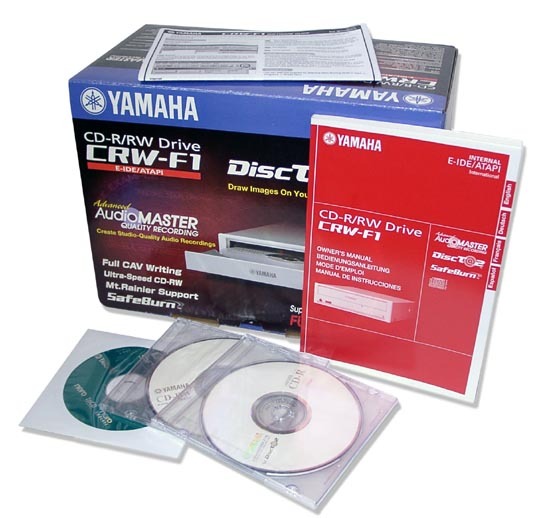 This three-layer technology provides exceptional reliability and optimal quality of data recording on CD-R\CD-RW. In the new drive the company integrated its new quality conception Q-MAX. er jitter than a punched disc, hence worse sound quality. The Audio Master reduces a jitter level by 30% making the sound clearer and fuller in reproduction of highs, mids and lows, and it makes spatial perception clearer as well. 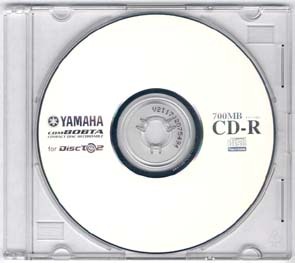 This technology is revolutionary as far as audio data recording onto CDs is concerned. The Optimum Write Speed Control carefully watches what you load into the drive. Unfortunately, even with this feature disabled you won't be able to record a disc which is not meant for high-speed recording, say, at 44x, in spite of the fact that Nero lets you set 44x for recording. Imation 32x and Philips Silver 32x discs, as well as TDK d-view and Reflex are successfully recorded by the CRW-F1 at 44x. The design of the new drive hasn't changed since the CRW3200. The internal models come with a white front panel and the external models have a silvery casing. Both models have stylish LEDs working in two color (blue and purple) modes. The rear panel incorporates a digital output. 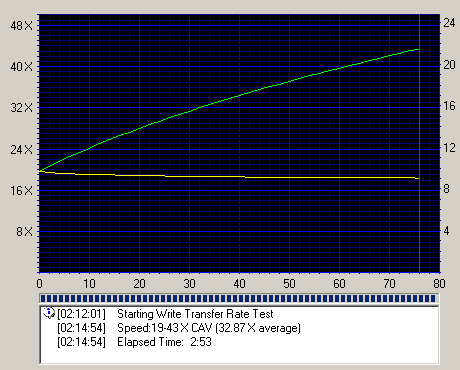 The drive has a black tray which, according to Plextor, improves quality of CD recording. In spite of a high speed supported, reading is rather noiseless, it is even quieter than in case of the CRW3200.